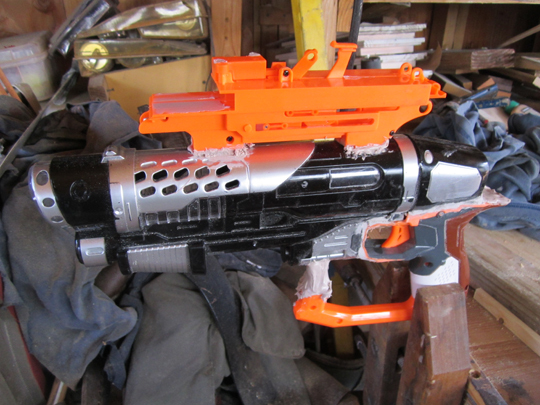 I wanted to build a space sci fi type pistol by modifying store bought guns. 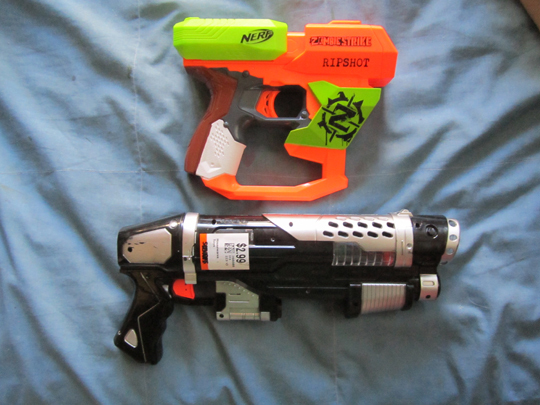 So, I went to the thrift store and found these two plastic guns. 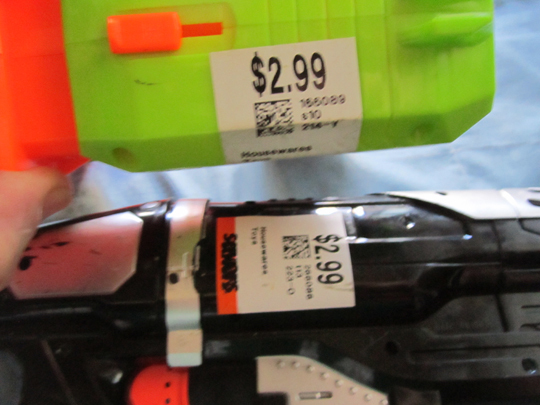 They were a few dollars each. 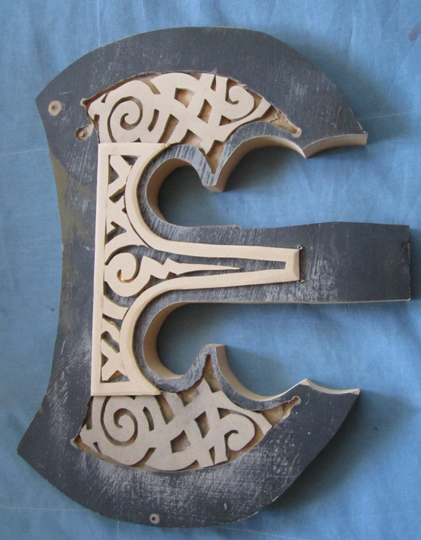 I cut them apart using a dremel tool and a scroll saw. I cut off the old handle of the black pistol and cut the orange handle to fit. 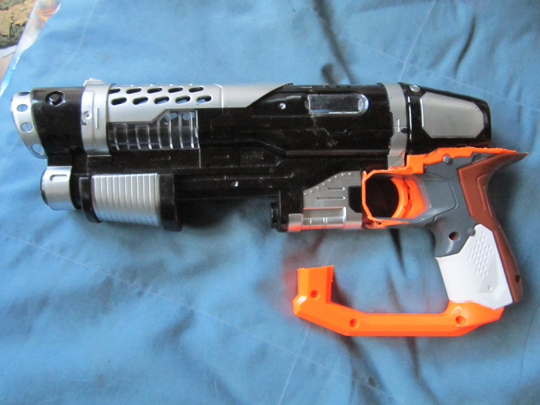 I also cut off the top of the orange pistol and cemented it to the top. 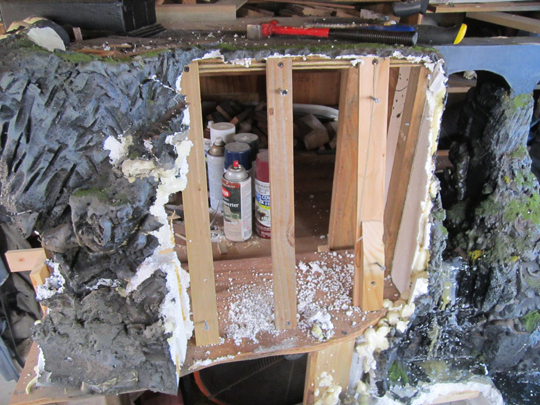 I used two part epoxy cement to attach the parts, and auto body filler (Bondo) to patch the seams. 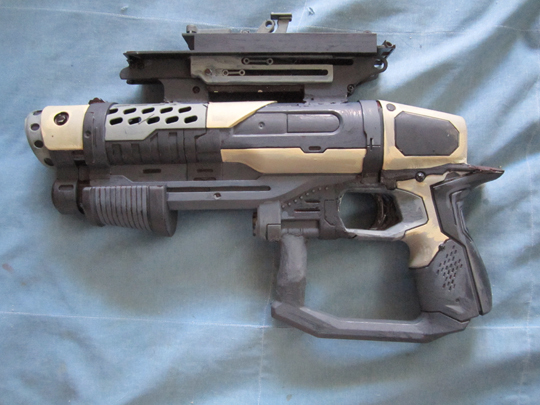 I sanded the bondo with the dremel tool. 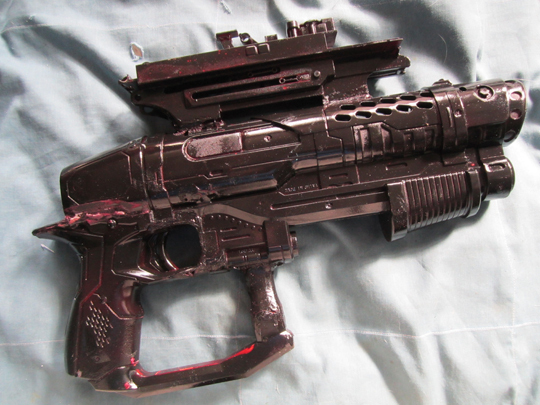 Once it was pretty well done, I primed the whole thing with red primer then black spray paint. Then with a brush, I painted each section. I kept my palette to four colors. Go ahead, board the space cruiser and blast away your enemies, have some fun. 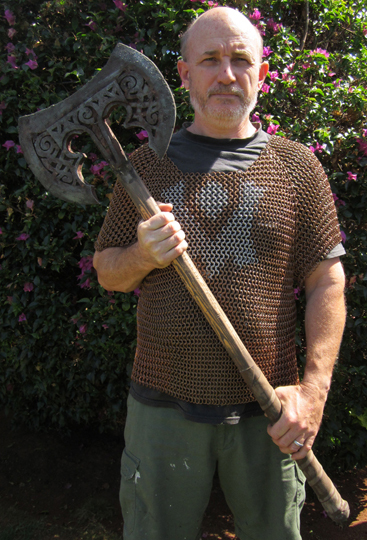 I needed a large double-bladed battleaxe, because well, who doesn’t? 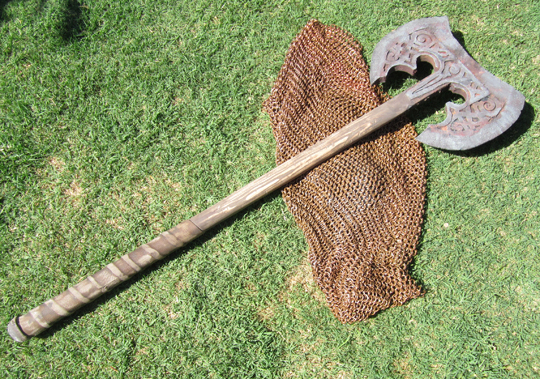 So, I began by finding an image of a steel battleaxe from Skyrim game online. I drew out the design on mdf. 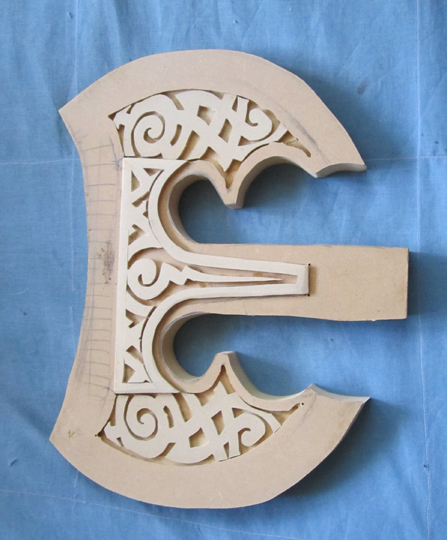 I drew the celtic knotwork on thin MDF (1/8″) and cut it out with the scroll saw. 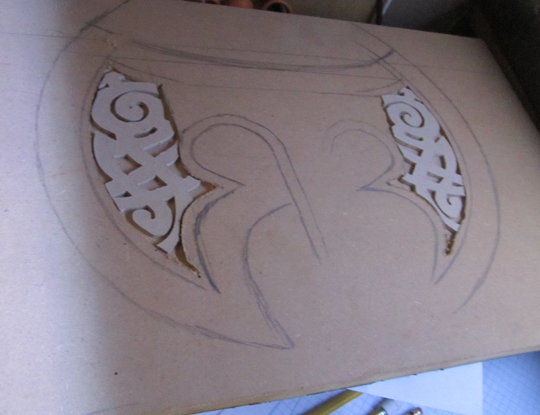 I routed a depression in the thick MDF (3/4″) for the knotwork to fit into. This gives crisper details than trying to rout out the design. 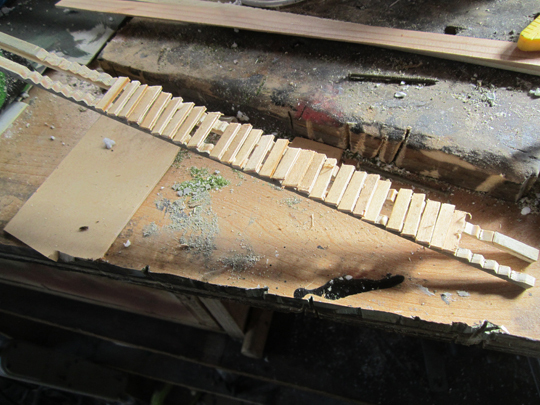 I stacked four layers of the 1/8″ thick MDF together and cut them all at once. Glue the raised piece of knotwork in place. 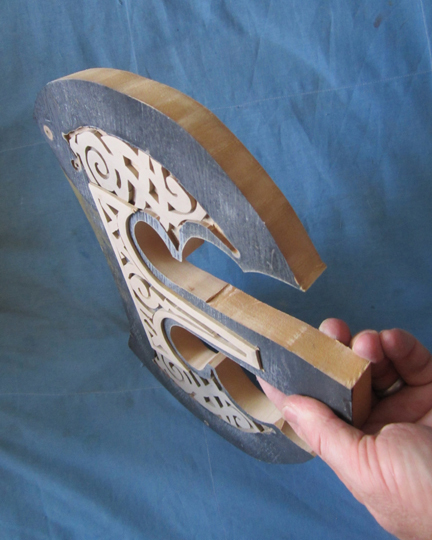 Cut the shape of the blade out and sand down the edges to sharpen the blade. This is where I realized I screwed up. I had to put the handle in but now had a finished head. Thought about it a lot and ended up cutting the part of the design off, routing a deep groove for the handle to sit in and then had to rebuild the design. Lesson learned, start with the handle and build up around it. That is the backside. The black paint was already there. 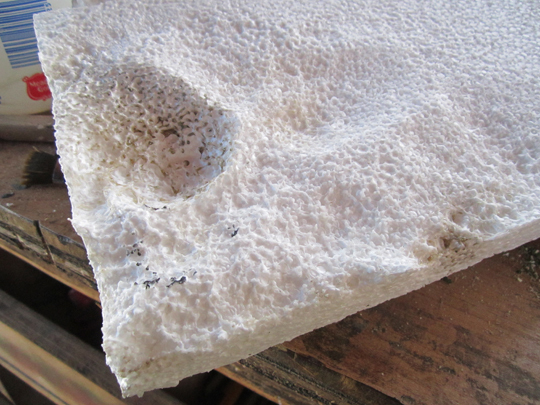 The MDF was salvaged from another project. That image above shows the thickness before I sharpened it. 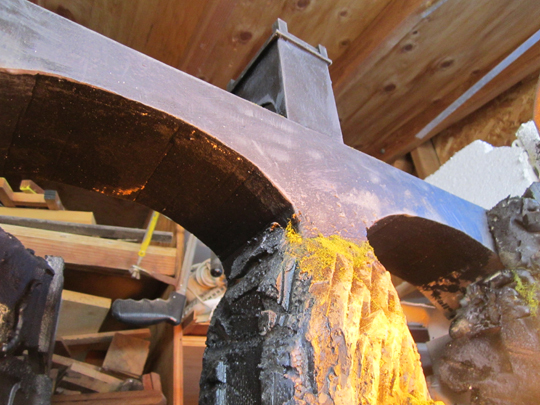 In the above image you can see where I had to cut the black head and rout a groove for the handle. 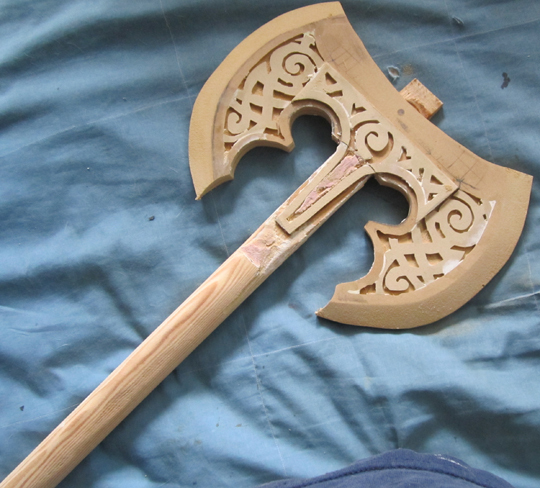 The handle was two pieces of flat pine wood that I shaped to be round with wood rasps and sanders. I added some patch and tons of sanding. I added tons of rusty paint colors to the blade, and a leather wrap for the handle. To age the leather, I dripped black paint on it, sanded it, and rubbed it down with motor oil. Then I rubbed dirt on it and sawdust all over it. 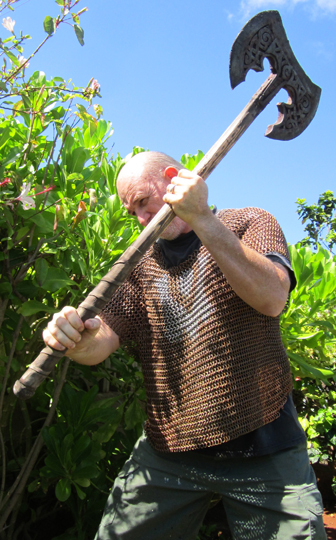 Go ahead, make a mess, craft a rusty battleaxe, have some fun. When you have very little space to create, you need to learn how to make a project then break it down and move on to the next one. 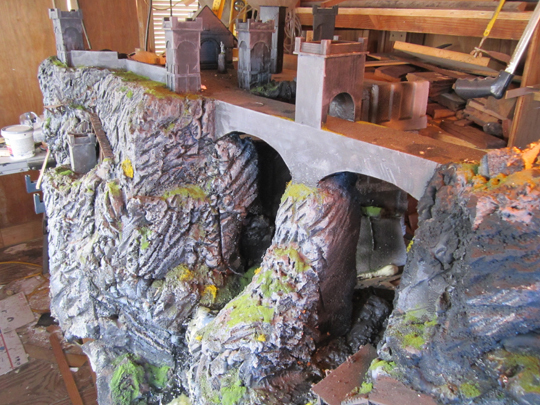 Today I took down the miniature castle set. It is like the Buddhist monks that do those incredibly detailed chalk drawings and then blow them away when they are finished. Art needs to be created, and sometimes it needs to quickly be destroyed so you can move on to the next project. Not all art is permanent. If you have a huge farm, and tons of space then make all the permanent art you wish. And invite me over sometime. But for the rest of us, you have to learn to let it go. I will save the towers for a future project maybe. 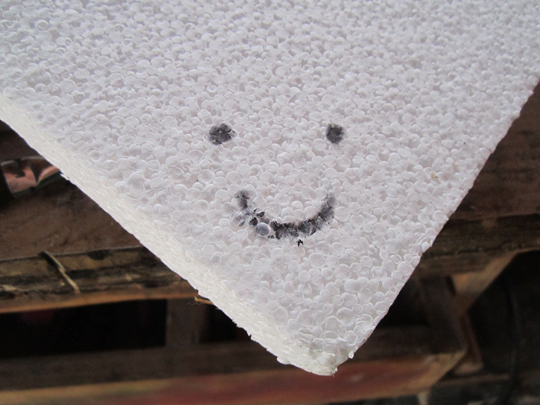 But all the bulky styrofoam gets thrown away. 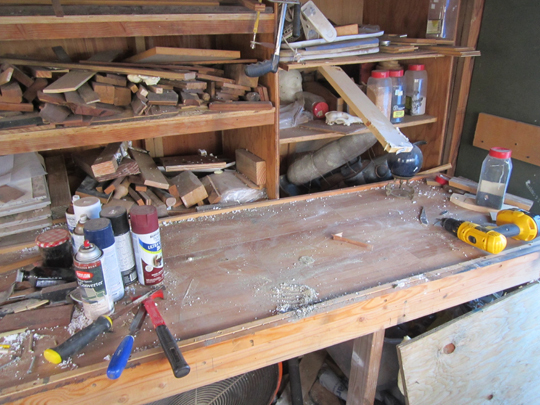 There you go, an empty workbench again which to me is a blank canvas. Now I have unlimited potential again. 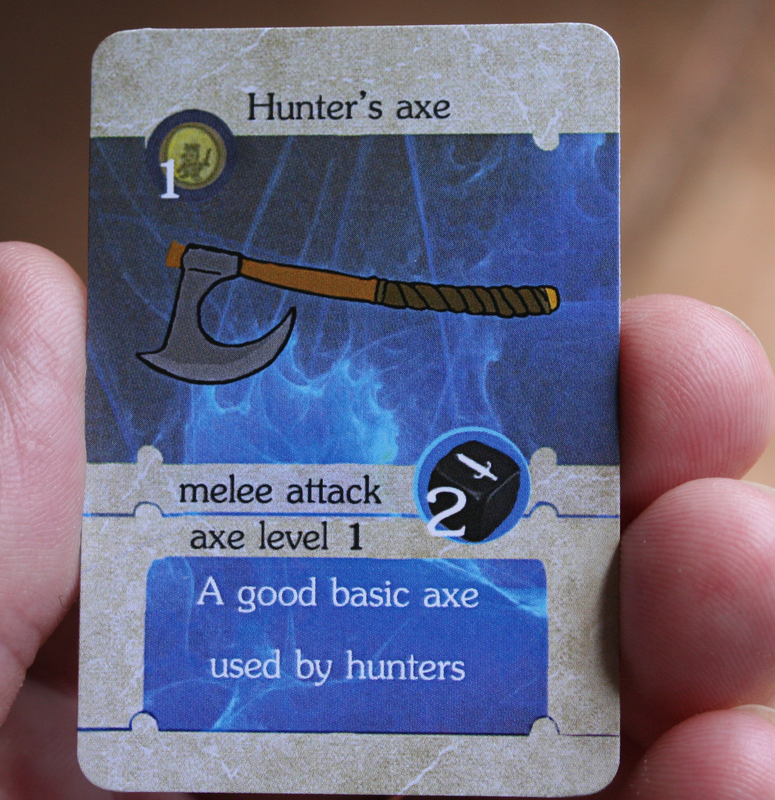 Hmmm, maybe a dual bladed battle axe? Go ahead, make something cool, then tear it down and make something else. 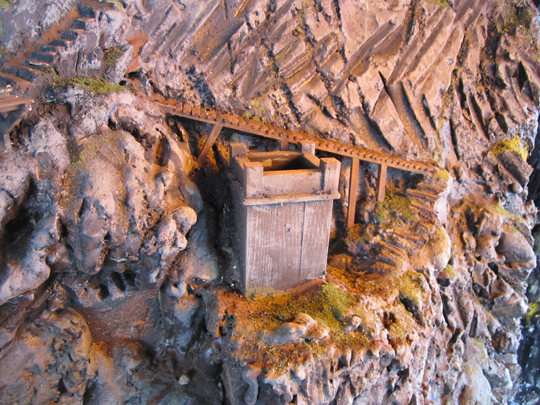 I took some photos of the miniature castle set the other night. I took some in the daylight but got too much white glare. So, I took some at night but it was too dark. Then I found a yellow light bulb and took some more. So, it looks great. Yay. You can use flashlights and household lights to light your scene. Take tons of photos from a bunch of different angles. The more you build in real life, the better it looks and the easier it is put together. But it is easy to fix things left undone in photoshop. You can see in my image I left plenty of background rubbish. If I am just going to use a still image and not video then this is a really easy fix. I put the raw image in photoshop and erase out all the garbage areas. I fill it in with bright green. It took about 15 minutes or so, no big deal for a single frame. Now I found some images online, keyed out the green with the magic wand, and filled in the background with some rocky cliff pictures. 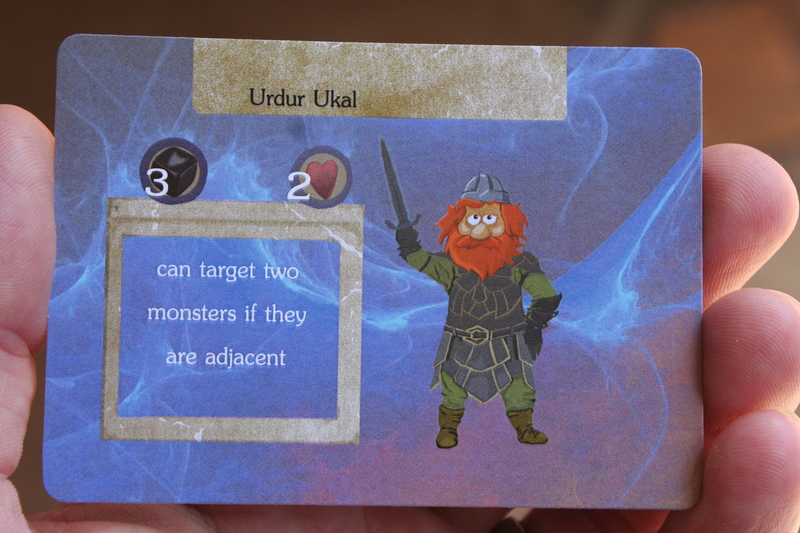 Match the lighting the best you can and you now have a workable background. 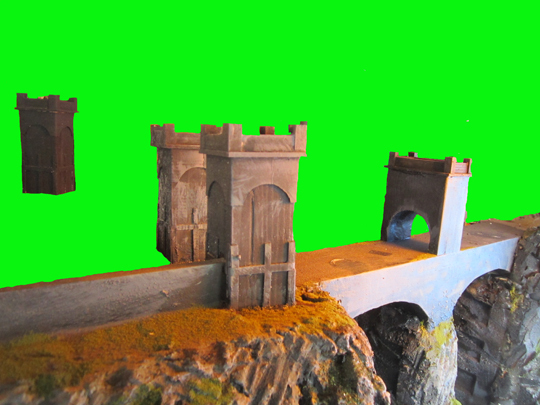 Just film your heroes in front of the greenscreen, then add them walking across that bridge. 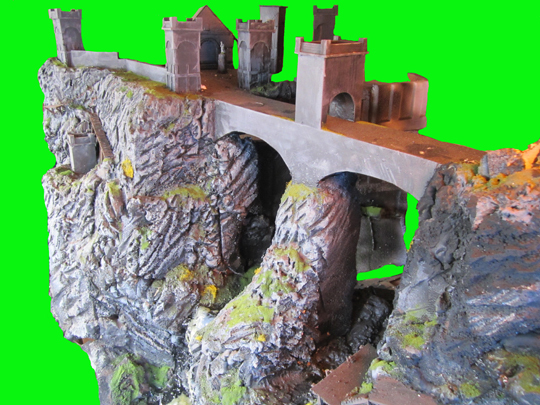 Or film your dragon puppet flying around, then greenscreen him right on top of this background image. The more you can fabricate, the more realistic it will be. But eventually you reach a point where you are bored, or out of money and decide to stop. This is where your photoshop skills will come in to play. Here are a few more images. Even though the ground is missing, the other tower is perfect perspective and has perfect shadows and highlights because it really exists. That image is untouched. You can see the yellow hue from the yellow bulb I am holding while I photograph it. With a real model, you can shoot many different angles and intercut them with the main image. 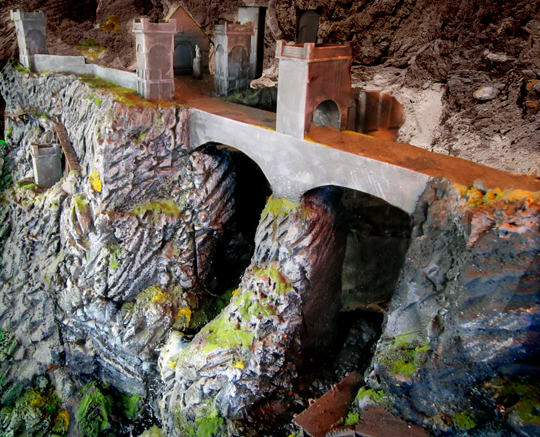 Heroes cross the bridge, dragon flys overhead, we cut to the shot as the dragon flys through the arches. I give you permission to use these images in your film if you would like. I would love to see what you create. 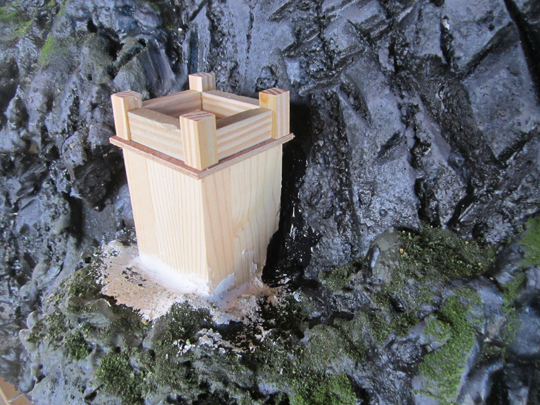 Go ahead, make a miniature castle set, have some fun. So, I had to make some stairs down to it. 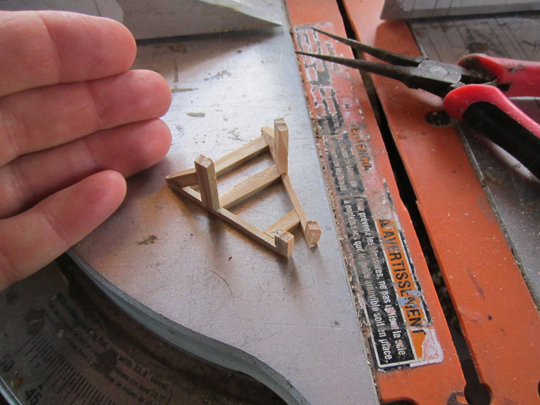 I cut two “stringers” which are the side supports just like real stairs are cut. 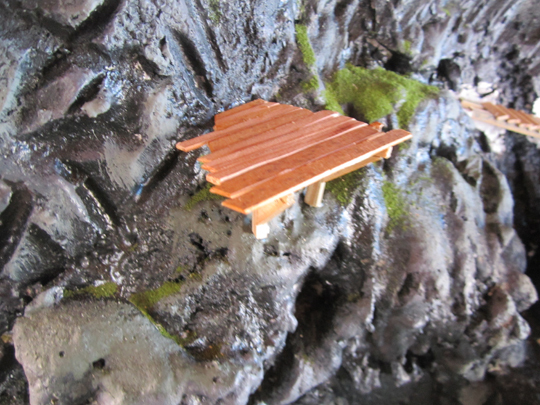 Then I placed tiny treads in place with glue. I had to place a few, let them dry, then place some more. None of this is necessary of course, but when you have the skills and tools, why not add it. 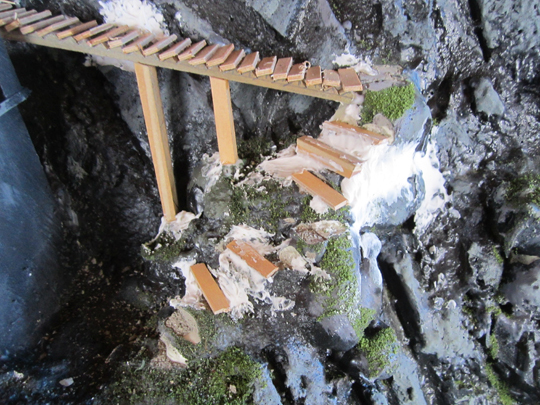 I had to cut part of the cliff face back to install the stairs. I tried to imagine a tiny dwarf rock cutter out there with his tiny hammer. Everything in your tiny world has to make sense. Once they were in place, I needed some supports under neath. Once this was all in, I noticed a nice place for a deck, to the left of the tower. So I constructed the supports and bracing like a real deck would have. I made this first off to the side. That image above shows the support, upside down, with the legs sticking upwards. It had to dry flat before I installed it. 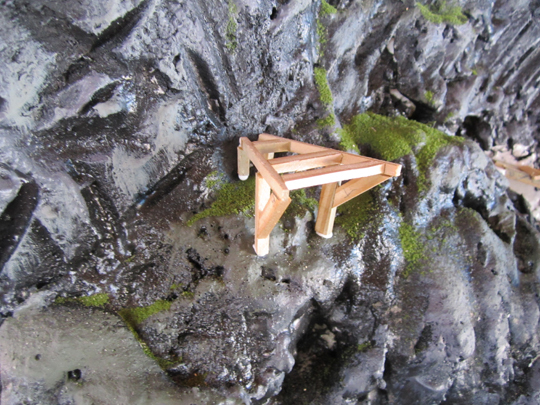 There is the deck framing in place on the mountain. The stairs can barely be seen on the right side. 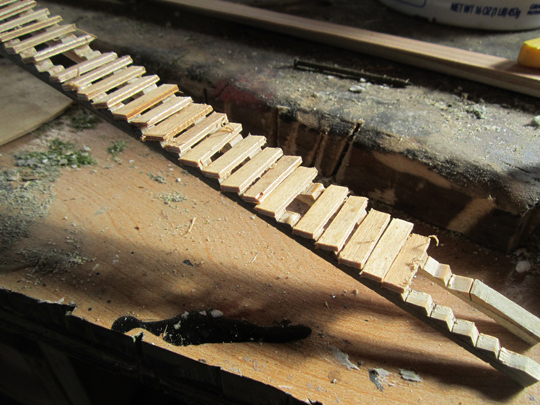 Once the frame was in place, I added tiny little decking boards. Try to keep everything in the correct scale. 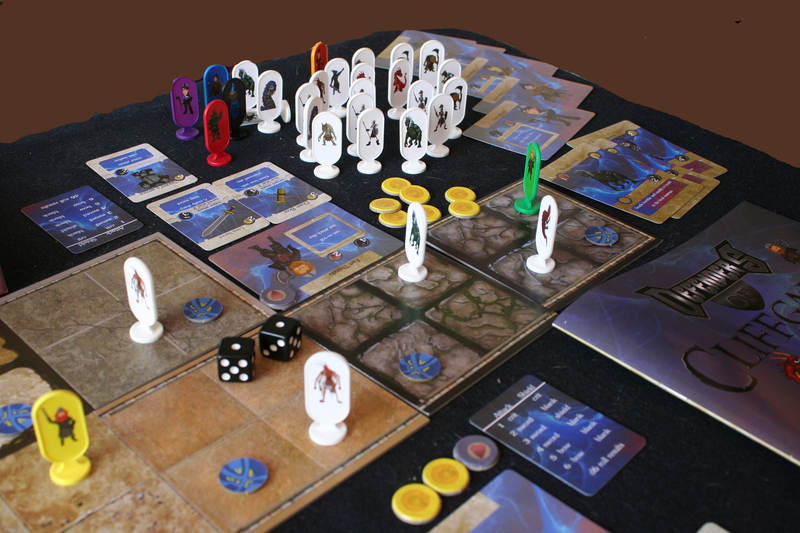 Keep referring back to your miniature figure. The boards are extra long here. 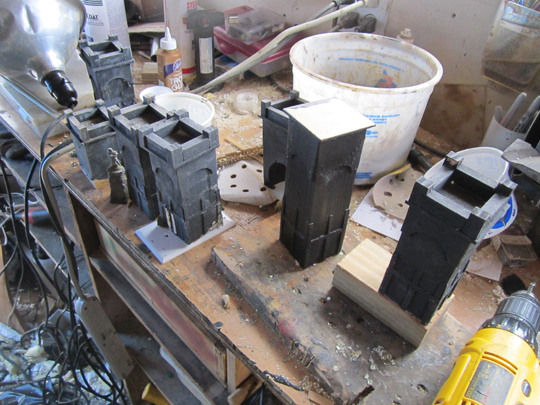 They will be cut to proper length later after the glue dries, with a dremel tool. 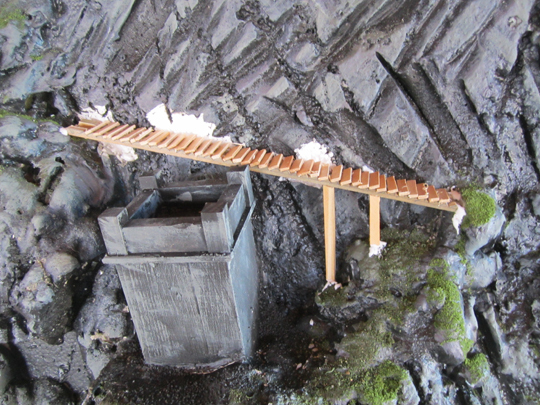 At the bottom of the stairs, some steps needed to be cut into the rocks so the guard could reach the actual tower. 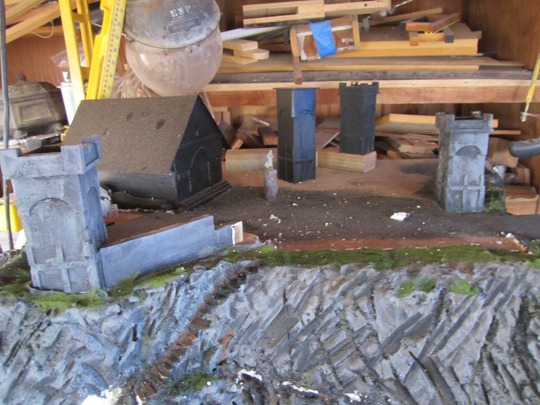 They are cut into the rock, and then a wood slat added on top. All that white will be painted. 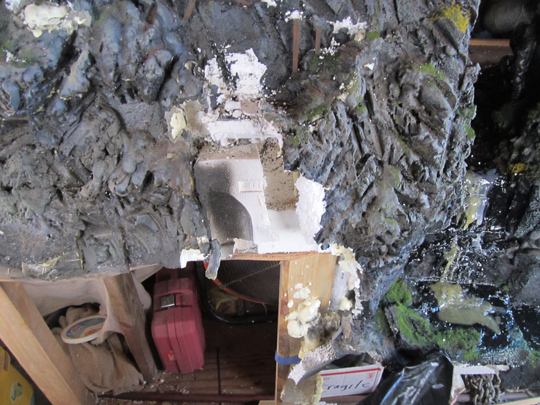 Most of that white is painter’s caulking to patch holes. 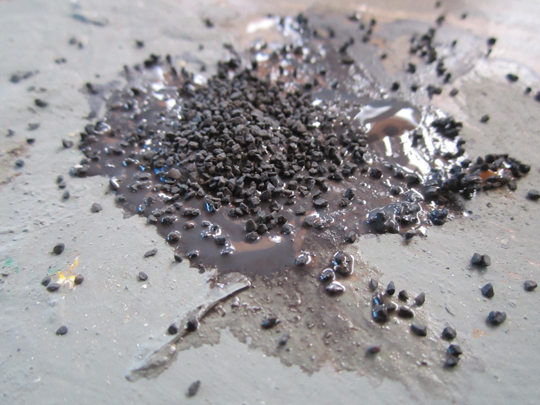 Another tip for you is use a little bit of the gravel material directly in your paint. 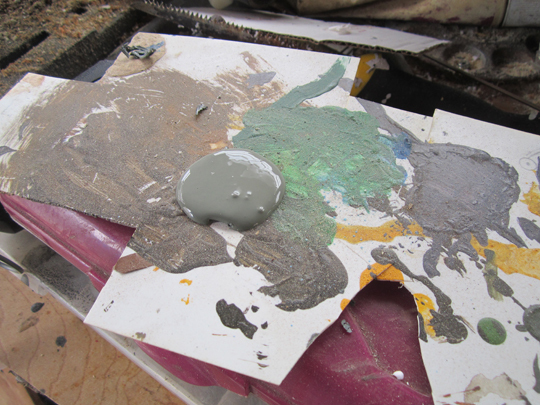 Put a blob of paint on your palette, and sprinkle some gravel medium in it. Stir well. Then dab this mixture on your set where you need small rocks or texture. The paint colors the gravel, but also will glue it in place. Go ahead, start having fun with your set. I added another tower on the side of the cliff. It is just wood pieces. 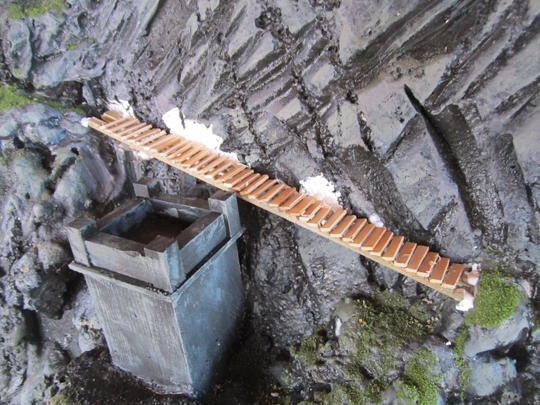 It was installed then patched with caulking where it joined the cliff face. Let’s take a little side trip here for a moment. Here is a little tip for you. 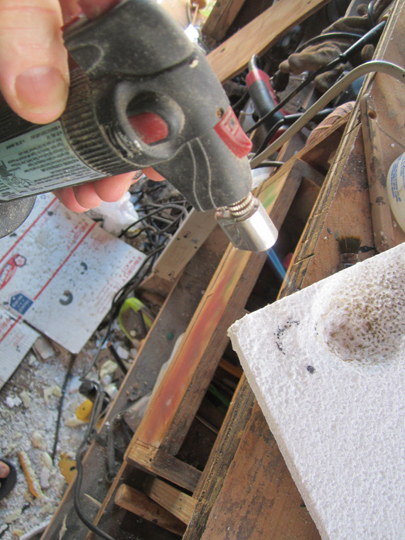 You can make natural rock textures in styrofoam with a heat source, either torch or heat gun. Here is the brand new piece. Now watch as I carefully wave over the surface with a micro butane torch. 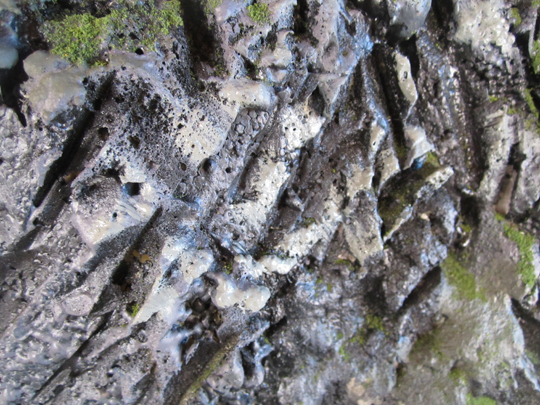 The foam melts and leaves a pretty rough rock like texture. Go slow because the foam is very quick to react. Don’t breathe in these fumes because they are bad, not the smell, but probably not good to breathe in. The above image is what it looks with just the torch. It really takes away the flat styrofoam feel and look. This a great technique, just go slow, and be safe. Don’t catch things on fire, and beware the fumes. Here is another little note for you. Things don’t have to be perfect for you to create. You don’t need the perfect tools, or perfect parts, or perfect work station. The image below is my paint palette. It is a piece of scrap plasticard. The paint is some craft paint that I found on sale for less than a dollar each. I have met artists before that require everything to be perfect for them to create. I think to this day they are still waiting. Anyway, back to the project. Did I ever mention that I have a sun? 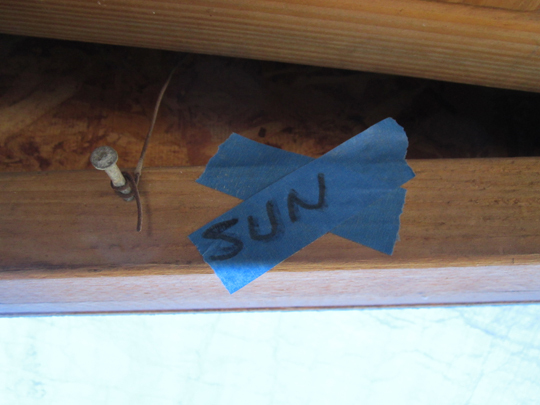 Yes, I place tape on the wall so I know where the sun is in relation to my set. That way, I always know where to paint the highlights and shadows. That is another round of lighter gray paint on the highlight areas. Go ahead, be perfect, and wait forever, or just get messy and get some art created.